The Can You Stomach Us? 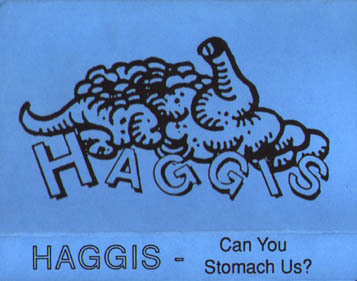 cassette was the 1st release by Haggis. Most of the songs were recorded in my neighbor's apartment on his 6-track cassette deck. He was inexperienced with mixing and didn't do a great job. I still have the original 6-track cassette, but I don't have a deck to play it on. 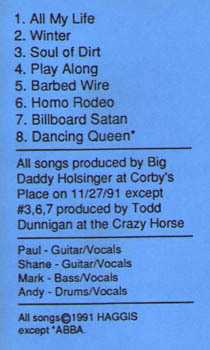 The other songs were recorded at the Crazy Horse on 9/24/91 when an engineer from a local studio rented the place out, brought in a DAT, and recorded some bands. There was no audience. The standout track on this thing has to be Dancing Queen, and I'm sorry we never recorded a studio version of it. Other than that track, I wouldn't bother downloading this stuff unless you have nothing better to do. If you got here from an external link, head to the main DieHippieDie.com pages.